A mirrored passing design is an offensive play structure in which the receivers to each side of the formation run matching routes. The play is often called from a 2×2 alignment and allows the offense to run a passing concept such as a smash route or a curl/flat route to each side of the field, setting up the mirrored look to the play. The quarterback is given some pre-snap reads based on coverage, defensive formation, and the spot of the football, then executes a half-field read based on those pre-snap indicators as the play unfolds. This design can simplify the offensive structure for the quarterback while still giving the offense potential options on each side of the field. The Ducks run a mirrored passing play here, with a dig/curl combination to each side of the field. The outside receivers run deep dig routes while the inside receivers run short curls, creating high/low reads to Mariota’s left and right. The Huskies flash Cover 2 at the snap but the cornerbacks bail and roll into Cover 4. Mariota initially reads this play to the short side, but the inside quarter safety on that side squats on the dig route, forcing Mariota to survey the opposite side of the field. The quarterback comes to the dig route on the back-side, makes a strong throw, and the offense moves the chains. This is how the Ducks use mirrored passing plays, with the QB looking first to the short side of the field when the coverage is balanced ‒ as it is in Cover 4. Adams creeps down toward the line of scrimmage, influenced by the out pattern from TE Matthew Mulligan (#82). On the outside, Butler maintains outside leverage for a time, but Harvin’s acceleration eliminates the cushion quickly. When the CB turns his hips to run with Harvin’s vertical route, the WR turns on the afterburners and is able to angle his run to the outside of the defensive back. From here it is a pure foot race. For his part, Taylor executes a very solid five-step drop from center and, after planting and gathering himself, he launches a perfect rainbow that Harvin runs under right at the goal line. 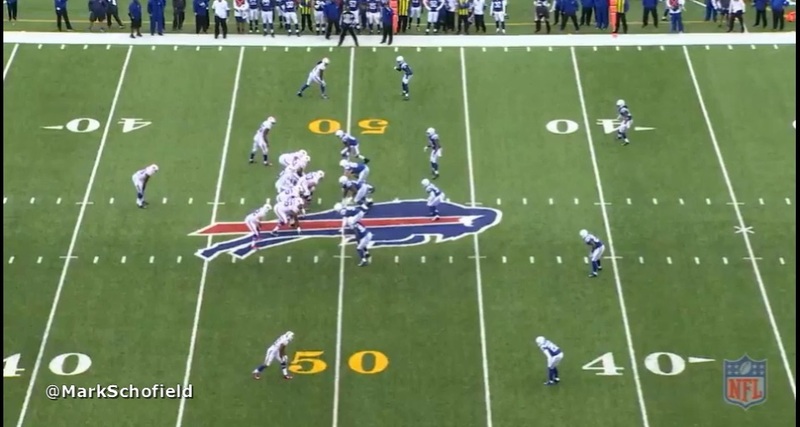 Just the way offensive coordinator Greg Roman drew it up. Here is another example from the NFL, courtesy of Alex Smith and the Kansas City Chiefs. Smith and the offense face a 2nd and goal at the Pittsburgh Steelers’ 6-yard line. They have 12 personnel in the game and the quarterback under center, using a tight slot formation to each side of the field. 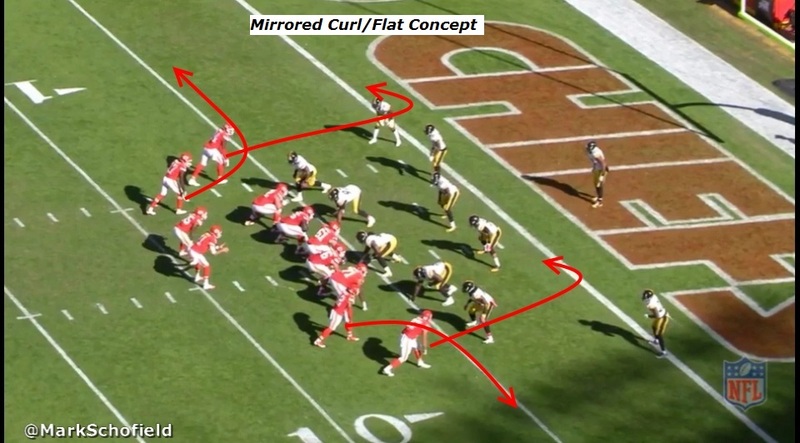 Pittsburgh has its base 3-4 in the game, showing Cover 1 in the secondary. Smith takes the snap and reads this play to the left – the wide side of the field. 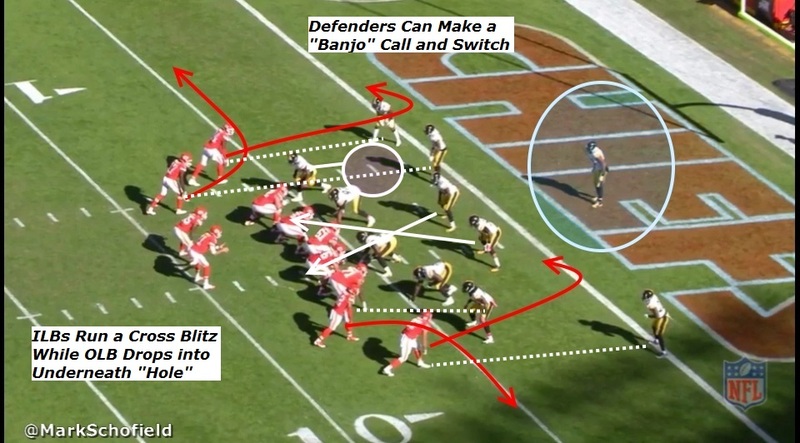 With the inside receiver breaking out to the flat and the outside receiver working inside on the curl, the Steelers can choose to use a “banjo” call, in which the cornerbacks switch their responsibilities. Or they can each decide to stay with their man as indicated by pre-snap alignment. As TE Demetrius Harris (#84) releases on his curl route from the outside alignment, Harrison drops under him him while safety Robert Golden (#21) rotates over to him. Meanwhile, from the slot, receiver Chris Conley (#17) cuts to the flat. Cornerback Antwon Blake (#41) begins the play over Harris and initially drops with the tight end before breaking on the WR. But the slight delay gives Smith enough of a window to find his wide receiver for the touchdown. Video and images courtesy NFL Gameday.